Welcome to the September 8th edition of Tuesday Couch Potatoes, where we feature a movie each week. Today's theme is Suspense Thriller. What movie kept you awake in the night or gave you goosebumps? Come share it with us! How would you react if someone who tells you, "I see dead people."? Would you be terrified? Run for your life? Because I would! I must admit I am not really a big Suspense-Thriller fan because I am a scardy cat. I do watch it from time to time though, especially if I am with good company (a.k.a. my-then-BF-now-Hubby) and if the movie reviews and preview is intriguing. You'll never go harmed when you are beside your Knight, right? So with my shawl to keep me warm and to cover my eyes, I always muster enough courage to step into the theater or sit in front of the TV. The Sixth Sense is one of those movies that had me sitting on the edge of my seat and silently screaming. The storytelling, the compelling mystery, sound effects and cinematography was so great that I can't help but get boosebumps. This is also the movie that made M. Night Shyamalan so that whenever you watch a Shyamalan film, expect mystery and thriller. There is a twist to the movie though, which is only revealed in the end... and I had to watch this two more times before I really got it. Imagine what I had to endure just to get everything together! Thanks for joining us this week! Next week, we will feature our Favorite Disney Fairytale Movie. 'I see dead people' is also my signal that it's the Sixth Sense! "scared scared scared! * I can't remember how many curses I mentally blew into the air for being freakin terrified by the Sixth Sense. Oh my I gotta see this hehehe, pretty scary.. The Texas ChainSaw Massacre is my entry..
Me too!I will surely die in terror. I'd seen this movie & I like it too. i liked this one a lot. haley osment gave such a great performance on this one. plus, i had goosebumps watching it. 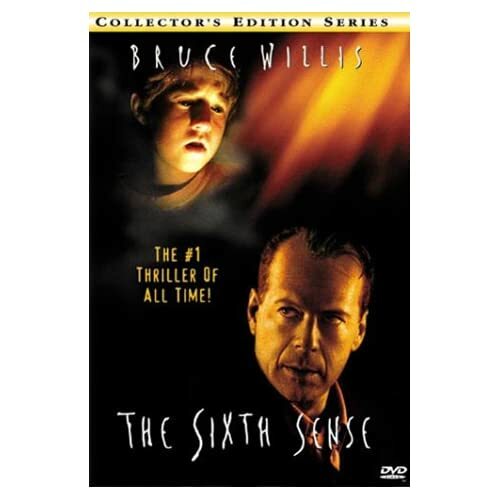 i saw sixth sense din and since m not really a fan of suspense movies- i didn't get over the movie for months.... I still couldn't look under the bed without any people around. oh, "I see dead people." haven't seen this movie, looks scary talaga. posted my first entry. this one gave me a nightmare..
i like this one..it's not that scary naman kahit may ghost..I like the part where the boy helped revealed the real cause of the girl's death and the twist sa ending..ang kulit!...he..he.. yeah i have seen this one! creepy... interesting plot too! I don't know what i would do if I see dead people hehehe watch six sense lol. this is a nice movie, basta bruce willis superb! Thanks for inviting me to join this movie meme at my main blog. Hope you guys could visit! Thanks!